"i am a really shy human, i swear. if i can do this, you can do it." As you probably know, Quiet Lightning recently filed its articles of incorporation as a non-profit organization (status: pending). 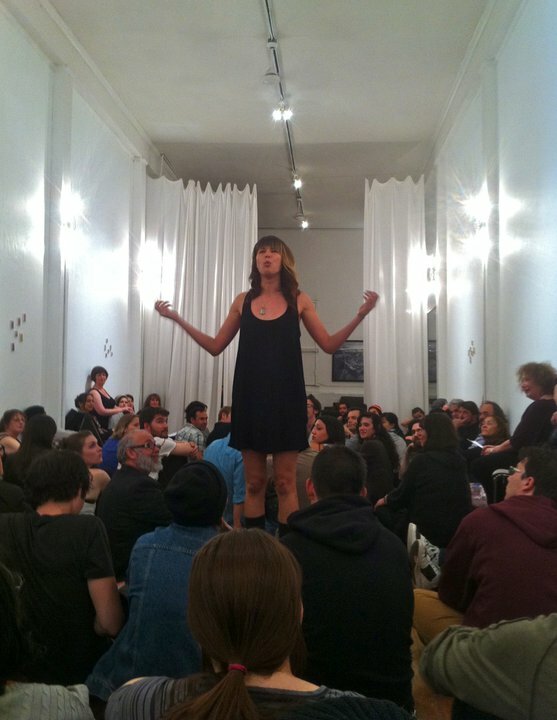 This month’s show, Apr 4 @ Mina Dresden Gallery, was the first QL show since the formation of its board and the first time the series teamed up with Litquake (other than last year’s crawl). Of the approximately 130 people there, about 33% had never attended the series. Some people were so excited they signed up for the mailing list twice (and they had the clearest handwriting). So what makes this series so exciting? Nobody knows what’s going to happen … even after you know who’s reading, you still don’t know how performative they’ll be, or what kind of writing they’ll read, or how each reading will affect the others. Beyond that: what will happen next month? Nobody knows. The QL Board is open. Committees are being established. For the first real time, outreach is in progress. How will the series change when we actively send a call for submissions to every university, writing group, MFA program and community center? What will happen when other organizations (like Litquake!) start attending our events on a regular basis? Maybe they’ll start participating! Everyone is welcome and should feel welcome. Quiet Lightning is not about name or reputation; submissions are assessed anonymously, and that is why we get such an extraordinary mix of writing styles and personalities. You don’t need names to bring in bodies. You need something we can all believe in: ourselves. You could be Quiet Lightning too. Submissions for the Monday, May 2 show at Café Du Nord are open until Thursday, Apr 13.